"The Quotations of Coco Chanel"
"The Quotations of Coco Chanel" is arranged by CAROLYN... author of the Coco Chanel blog site... A Blog about ALL things Chanel!!! 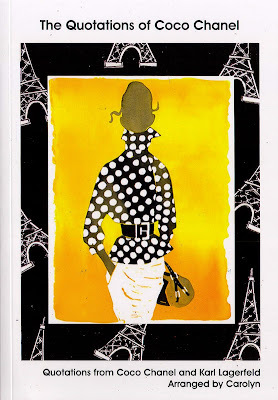 The book contains Famous Quotes by Coco Chanel and Karl Lagerfeld... and Fifi Flowers black and white illustrated backgrounds... along with our fabulous illustrators... and a Designer Handbag Shopping Guide! I am soooo happy to be able to help Carolyn bring this book to EVERYONE... I hope you ALL ENJOY it!!! This is FAB, Fifi! I LOVE the book and so does everyone who picks it up. I really love telling my friends I know who did the illistrations! Thank you so much for sending me a copy! Wow Fifi, this is great! Many congratulations all around! Fifi, This is just marvelous! Congratulations! I haven't seen your new header...very nice!! A post from Fifi? On a Sunday! Hi there, how exciting, I would love to win a copy of your book. I adore Chanel and of course all things Fifi! Should you, in great beneficence, decide to bestow upon this mere mortal this timeless tome, I promise to never leave my house without my pearls again. this is awesome. Please sign me up. Wow how fun. a book with your illustrations in it. I would love to win one. I will go check it out. I love Coco Chanel's style. Love your beautiful Paris paintings. It must be amazing with your wonderful illustrations and the famous quotes, which I know there are some great ones. I love it, you've captured the essence, the beauty, the sulty je ne sais quoi ... bravo! This just sounds and looks like some fabulous fun! Love the yellow white and black illustration. Just fav marked a couple of your prints on etsy too. Looking forward to making that purchase for my kitchen very soon. I've been wondering what this book is all about. You are the perfect person to be involved, Fifi. How exciting for you. . . and for us! Truly a pair made for each other! Please count me in for the drawing. Congrats! to you Fifi...I know you have knocked yourself out on this one! Congratulations on the book. Very exciting! And also exciting to enter the giveaway. Although not sure if i've missed the boat [not sure what time it is there]. What a great marriage - Coco & Fifi Forever! Now this a dream collaboration! How wonderful! I'm a month away from being in my new house. I think I've narrowed down my Fifi picks but I'm spoilt for choice when it comes to which vibrant and chic paintings I will have the pleasure of looking at each day! How very exciting. Would be thrilled to display this book for all to see and enjoy, especially moi. P.S. Thanks, FF ~ I edited my post to reflect that CC will select 2 winners ~ great idea! Hello FIfi, I enjoyed your visit and comment today. Congrats to your winners. I know they are thrilled. I sure would be if I was the lucky one. Big smile. Your Carolina art for Blue Monday is lovely. The totes are also very sweet. Thanks for the info on Couture Carrie's giveaway.